Hello! My name is Darvin Reilly and I am happy to say I have been a part of the Inner Fire Yoga community since January 2019! After moving back to Madison last year I knew I wanted to learn more about yoga and was lucky enough to have Inner Fire be right around the corner from my home. Not knowing what to expect my first class, I quickly learned I have really bad balance but I fell in love with the grounding feeling yoga brings to one’s mind. I have thoroughly enjoyed participating in Carly Lucas’ and Hope Henley’s morning Power Yoga classes, as they have greatly improved my range of motion and offer a moment of serenity in my otherwise chaotic day. I look forward to improving my skills with Inner Fire Yoga and know that it will become a foundational aspect of my living a healthy and fit lifestyle. My goals for the future include being able to perform an inverted pose by the end of the year and to continue increasing overall mobility and stability. I can say with sincerity that yoga has been the best part of my 2019, and I’m happy to be a part of the Inner Fire community! An Honored Inner Fire Yogi is an essential member of our community who has completed at least 300 classes at Inner Fire Yoga. 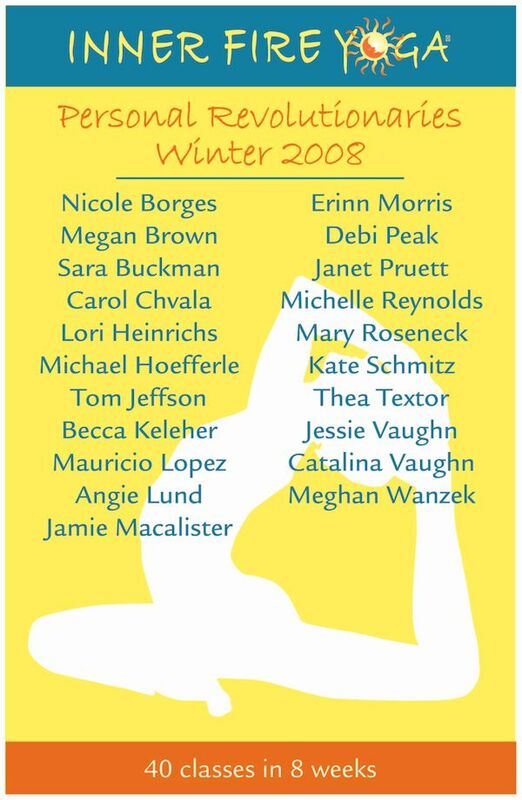 The time and dedication exhibited by these yoga practitioners has been key to the growth and success of our yoga studio. With gratitude we honor these most inspiring role models with a hand beaded glass bracelet in the color of the achievement level. Those reaching 1000 classes receive an amethyst bracelet. 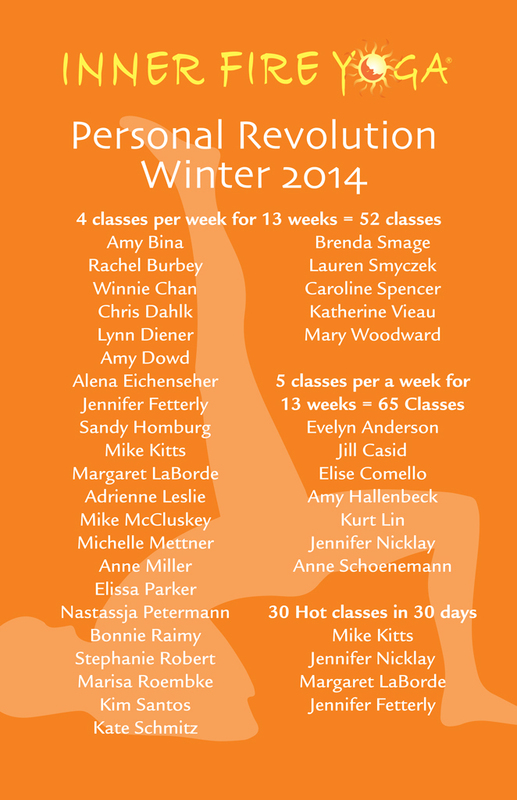 An Inner Fire Yoga Personal Revolutionary is an inspired and dedicated yogi who has achieved a group goal to practice a set number of yoga classes per week for a period of time. Usually this goal is 4 or 5 times per week for 2 or 3 months. Inner Fire Yoga typically offers this effort as a group 3 to 4 times per year. 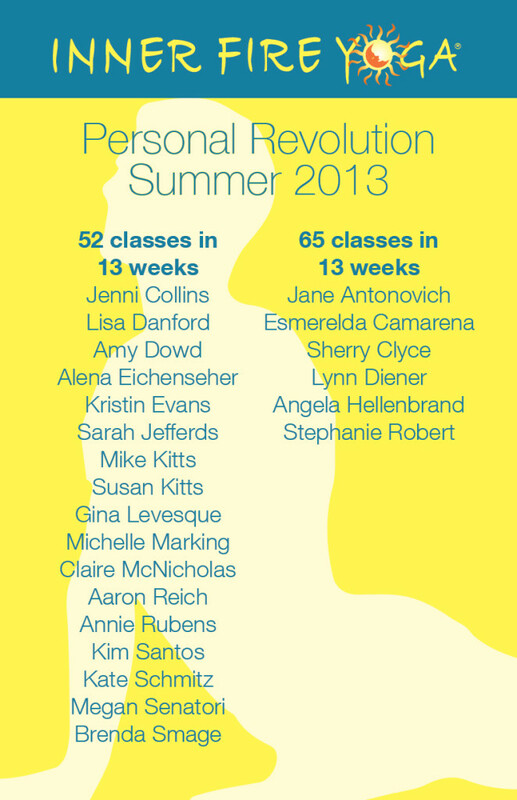 Those who achieve their Personal Revolution receive a medal. Students are energized and transformed from the experience! Our scholarship program was initiated as a result of a generous donation by a dedicated Inner Fire Yoga member with the request that the fund be used to help a student who would otherwise not be able to afford to practice yoga at Inner Fire Yoga. 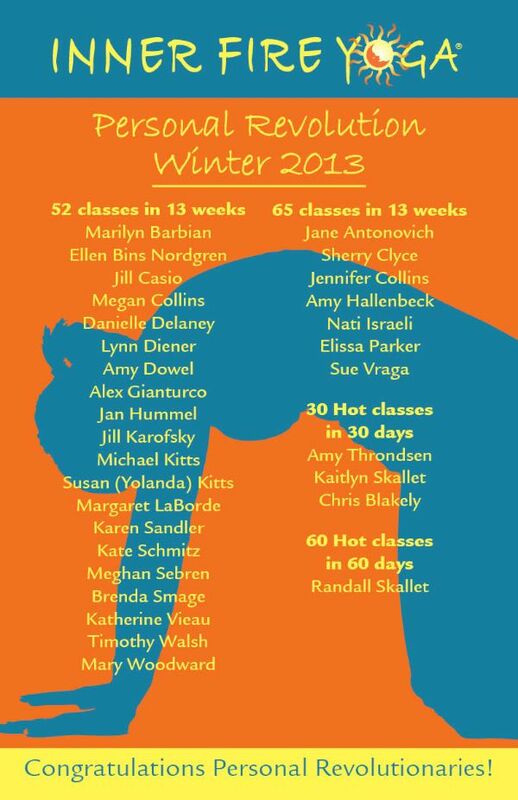 Inner Fire Yoga now continues to support this with biannual awards of 3-month unlimited scholarships. How often are scholarships awarded? Typically there will be two scholarship beneficiaries two times per year for a total of four 3-month unlimited yoga scholarships. You can nominate yourself! Or, if you know someone who would greatly benefit from a regular yoga practice at Inner Fire Yoga, but would otherwise not be able to afford to pay for a 3-month membership, then please send an email to us and tell us about this person, and why you think they should receive this scholarship. It is that simple. We ask that the person you nominate will know in advance that you are nominating him/her, that the person has agreed to participate, and that he/she will be expected to practice a minimum of 3 times per week during the scholarship term (starting the day of the award unless exception is requested) in order to maintain the scholarship for the duration of the three months. We ask that you qualify these facts in the nomination. See “Scholarship Nomination Questions” below. Our management team, comprised of Marit Sathrum (Yoga Teacher and Owner), Michael Hoefferle (General Manager), Hannah Moran (Studio Manager and Yoga Teacher) and Erika Ford (Sales and Marketing Manager), will review the email scholarship nominations and reward the scholarships to the person we deem to be most qualified. The recipient of the scholarship will be anonymous to our community: we will not publish the name of the scholarship winner, but we may publish the scholarship recipient’s testimonials (anonymously, unless otherwise specified by the recipient). An email will be distributed to our community approximately one month prior to the expiration of the current scholarship term, requesting nomination emails. Please respond before the expiration date for your nomination to be considered for the next scholarship term. If the person you’ve nominated is not awarded for the next term, the nomination can be re-submitted for the following term. Re-submittal for each scholarship term is required for continuing consideration for the next scholarship term. You can help a person who truly “needs” yoga but is unable to pay for membership, someone who will experience the beautiful and transforming benefits of a regular heated-yoga practice, the same that you have, by donating to the “Inner Fire Yoga Community Scholarship Fund” at anytime, simply by stating to the receptionist that you’d like to make a donation to the IFY Community Scholarship Fund. 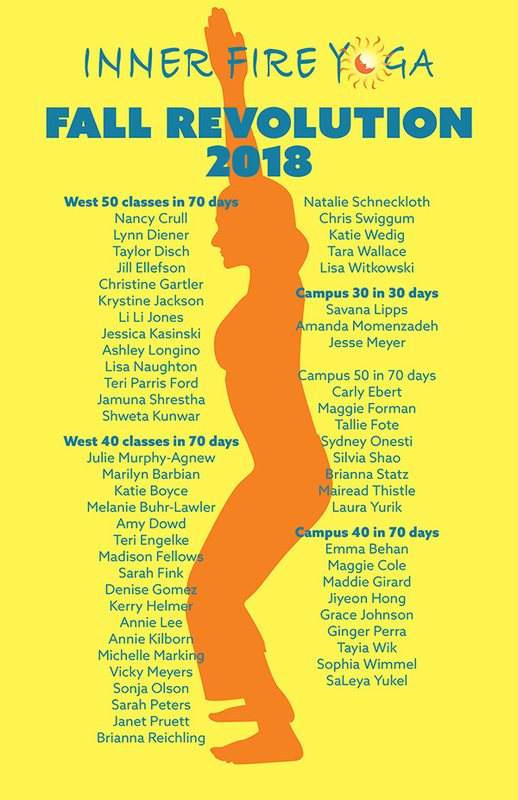 These donations will fund $300 at each new scholarship term (bi-annually) to pay for one of the 3-month unlimited-yoga scholarships.